The energy of your body will not be balanced and free flowing if you do not have good emotional balance, good physical health, and good relationships with your surroundings and yourself. Almost no one is ever perfectly balanced. If you could do this, you would be able to rise from the dead, have a body transformed into a cosmic molecular structure and commune with the gods as an equal. Don't despair, this has been done. Begin at the beginning. Get to know the feel of your partner's energy. Use hand-to-hand and switch hands to see if you can tell the difference between polarities. Touch energies (not bodies) and move within that energy to learn its character. When you're satisfied or have given up, or see the raven hanging around, run the full-body test. Get as naked as both of you comfortably can, and use your hands to test and map the energy of your partner. If you want, draw out a figure and mark bad spots so you can remember later. Got them? Front and back? Good! Now have your partner lie down. It's usual to begin work on the back, but not required. 1. Make a circuit with your hands as you massage. Keep hands well separated and on the same side (left or right). 2. 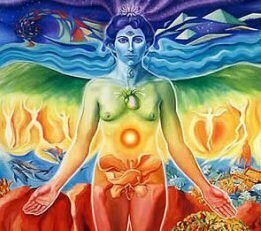 Work toward an energy center (such as a chakra). As you get close, keep one hand in contact with center and power energy into the center. 3. Don't tickle, don't be rough, and don't do anything you or your partner doesn't want to do. 4. Work from one side (left/right) at a time. 5. When you get to the center, go to the top (or bottom) and work back. 6. Remember to unblock bad spots as you go. 7. Do full the body, both sides, top to bottom or as much as your restricted culture allows you to do. 8. When done, rest a bit and test for bad spots again. Repeat if needed. The more you know, the better you'll do. Have patience, study, get someone with more experience to work with, practice, and you will be amazed at what you can do. What you have done so far is to get the attention of those little operators and wake them up. At least for a while, they will send back good signals. How rapidly this fades depends more on your partner's mental and physical health and on your energy strength right now than on techniques.